How to get started in nursing home or hospital clowning, plus what to expect and what to do once you get there. You will learn general guidelines from a clown experienced in both forms of caring clowning. Suitable for anyone interested in getting started in this special branch of clowning. A demonstration of props and routines Carole uses in her Caring Clown visits at nursing homes and hospitals. Lots of good practical material you will be able to use yourself. Suitable for anyone interested in caring clowning. Is your group interested in Caring Clowning? Carole will show you how and what to do. This all day workshop is an expanded version of her Introduction to Caring Clowning and Props and Routines for Caring Clowns classes. A two-and-a-half hour session part of the 13th Annual Northwest Festival of Clowns Big Thursday Workshop. How to get started in nursing home or hospital clowning, what to expect and what to do once you get there. You will learn general guidelines from a clown experienced in both forms of caring clowning. 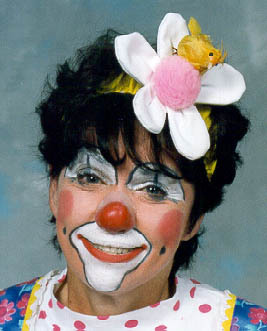 Carole will demonstrate props and routines she uses in her Caring Clown visits. Lots of good practical material you will be able to use yourself. Suitable for anyone interested in caring clowning. As part of the 13th Annual Northwest Festival of Clowns Big Thursday Workshop, put what you learned during the morning Caring Clown workshop to use. Gain practical experience in Caring Clowning this afternoon by visiting a facility in clown character. A basic hands on introduction for those who have never done balloon sculpture. You will learn to become comfortable handling an animal balloon, how to use pumps, and how to tie off a balloon. You will learn to make balloon flowers, the basic balloon dog that is the basis for many other sculptures, and how to do the poodle puff tail. You will also learn how to make balloon hats. Routines using bags, both gimmicked and ungimmicked, allowing you to entertain your audience. The different styles of change bags will be covered.